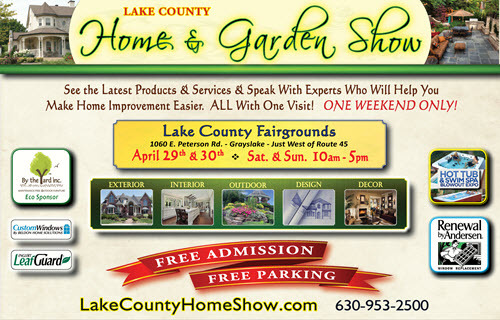 The Lake County Home Show with Free Admission and Free Parking premiers at the Lake County Fairgrounds on April 29th & 30th for the largest home improvement event in Lake County and surrounding communities. This massive event will offer homeowners the ultimate in savings and convenience and find inspiration for their upcoming projects. This 50,000 sq. ft. event will highlight hundreds of the latest home improvement products and services for thousands of the freshest ideas in remodeling, repairing and beautifying homes home indoors and out. This is also the best opportunity to meet and speak with local and national experts who are eager to help with all home improvement projects and questions. Homeowners will find inspiration for their upcoming projects by attending one of the many informative, free seminars running throughout the weekend, covering many of the most popular home improvement projects, as well as home related topics. Be sure to stop by and experience the ultimate in outdoor furniture at the By the Yard booth and lounge in premium, maintenance-free furniture and accessories made from 100% recycled materials. And don’t miss the Free Live Cooking Demonstrations & Free Wine Tasting by PRP Wines throughout the weekend and so much more! A special addition to this year’s Lake County Home Show is the Hot Tub and Swim Spa Expo, located inside the Home and Garden show. At Over 10,000 square feet, this Special Feature area of the Home Show will highlight dozens of Hot Tubs, Spas and Michael Phelps Swim Spas at a saving of up to 50%. From interiors to exteriors and décor to outdoor, this event makes home improvement easier! Find the best solutions for every home improvement need all under one roof at the only event of its kind serving Lake County and surrounding communities with free admission and free parking. Hosted at the Lake County Fairgrounds, 1060 East Peterson Road in Grayslake, IL, on Peterson Road, between Route 45 & Route 83. The Home and Garden Show is open to the public on April 29th & 30th, Saturday and Sunday, from 10am to 5pm each day. For more information, visit www.LakeCountyHomeshow.com.com or call 630-953-2500.